Organizers of Okaeri 2018 in front of JANM. 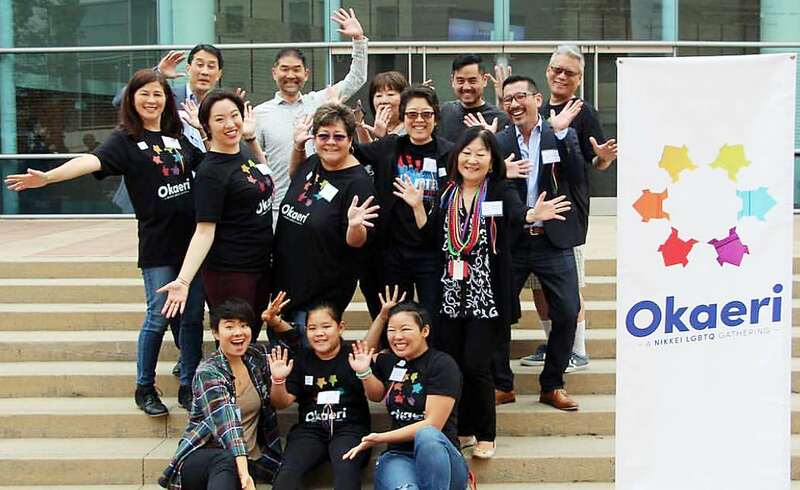 Okaeri 2018, the third biennial conference for lesbian, gay, bisexual, transgender and queer (LGBTQ) Japanese Americans and allies, will take place the evening of Friday, Nov. 16, and all day Saturday, Nov. 17, at the Japanese American National Museum, 100 N. Central Ave. in Little Tokyo. Okaeri 2018 will kick off at 7 p.m. on Nov. 16 at the museum’s Tateuchi Democracy Forum with screenings of four short films dealing with LGBTQ Japanese Americans, followed by a panel discussion with filmmakers and subjects of the films. On Nov. 17, a full day of programming will include two plenary sessions. One panel, moderated by Dr. Karen Umemoto, Helen and Morgan Chu Endowed Director’s Chair of the UCLA Asian American Studies Center, will focus on “Resistance and Resilience” during this era when so many vulnerable communities, including LGBTQ people, are targeted. Panelists are David Inoue, executive director of the National JACL; Kris Hayashi, executive director of Transgender Law Center; and Ray Fernandez, a Yonsei therapist. The other plenary session will center on “The Transformative Power of Storytelling,” and will be moderated by therapist and consultant traci ishigo. Panelists are Lei Ueunten, proud mother of a gender-queer child, and organizer of a fledgling faith-based parent support network in Honolulu; JJ Ueunten, a member of Invisible to Invincible: Asian Pacific Islander Pride of Chicago (i2i); and Melvin Fujikawa, a minister associated with Asian American Christian churches in Southern California and the Bay Area for the past 30 years. Workshop topics throughout the day will include “Family Acceptance”; “Mental Health”; “Japanese American/LGBTQ History”; and “Navigating Gender, Faith, and LGBTQ Identities.” There will be a workshop for Japanese speakers. In the late afternoon, separate small-group meetings for LGBTQ people, mixed-race Nikkei, allies, families, Buddhists and Christians will take place. Prior Okaeri gatherings, held in 2014 and 2016, each attracted more than 200 people from throughout the United States. To register for Okaeri 2018, visit www.okaeri-losangeles.org/register. Registration fees are $20 for students and seniors; $35 for adults. Discounts available for members of JANM. Scholarship registrations are also available.